Your website traffic to lead ratio simply means what percentage of visitors that come to your site turn into actual leads in any given time period. Whether your customers find their own way to your site or you guide them there from external links and ads, it’s essential that, when they reach your landing page, you’re able to capture real, usable, valuable leads. No matter how fabulous your site looks, and how convinced you are that it’s intuitive and user-friendly, if you’re getting a lot of traffic but aren’t converting visitors into leads, something is going wrong – and you need to fix it. For this, you need to divide the number of visits by the number of leads generated over the same timeframe. For example, if you have 1,000 website visits and 100 new leads in a month, that means your website traffic to lead ratio is 10:1 (or, in other words, you have a 10% conversion rate). For this, you need to bring in data from a few different sources, e.g. web traffic stats from Google Analytics or HubSpot, and figures on new qualified leads from your CRM. Let’s say you’ve introduced a new lead capture form on your website and you want to make sure you maximize its effectiveness. By tracking your website traffic lead ratio over time, you can make tweaks and test out the impact this has on your conversion rates. That might mean A/B testing, playing around with the layout and design, positioning the signup form more prominently, incorporating a pop-up form, improving your copy, or adding reviews and testimonials to your landing page to inspire confidence. The aim is to keep improving your ratio, securing a higher percentage of lead conversions over time. Realistically, your website traffic to lead ratio will vary widely depending on your industry, but if it dips below 2-4% it’s definitely time to rethink your content and lead capture strategy. 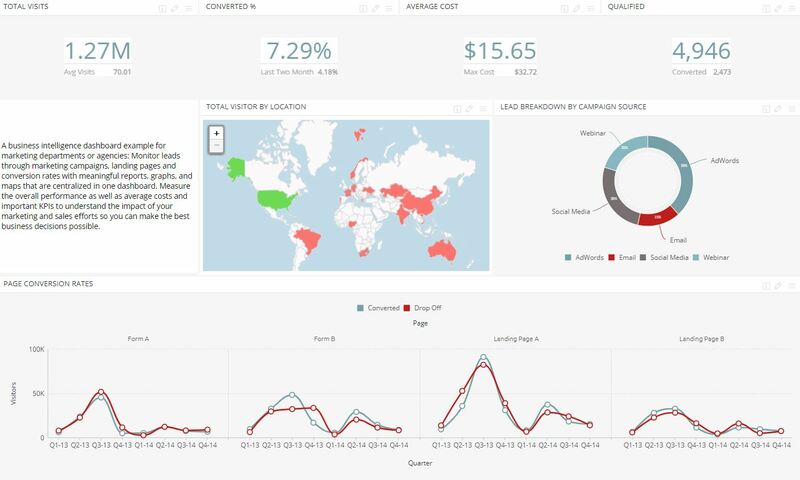 Curious to see how these KPI dashboards work in action? Click here to see some of our example KPI Dashboard templates and online demos.